Buildings are the top energy user in most cities, accounting for approximately 50-75% of citywide energy use.1 With energy efficiency policies that reduce such energy use, cities can increase economic opportunities for residents, make progress toward environmental goals and outcomes, and improve energy affordability. ​​When a city enacts a policy, the savings depend on numerous factors, such as the scope of the policy (e.g., how many buildings are affected), the implementation, and the energy use of the affected buildings (e.g., size, age, levels of efficiency). Local governments can enact buildings policies that affect new and existing buildings. Depending on the age and efficiency of existing buildings and the planned construction of new buildings, cities will achieve varying energy savings with the following policies. Even though the United States does not have a uniform national building energy code, the federal government does participate in developing the model national building codes, which states and cities can adopt. The national model code for residential buildings is the International Energy Conservation Code (IECC), and the model code for commercial buildings is the American Society of Heating, Refrigerating and Air-Conditioning Engineers (ASHRAE) Standard 90.1. The federal government encourages states to adopt and implement the newest energy codes. Some states cede authority to cities to determine building codes, while others allow cities to adopt their own local building codes that are stricter than the state codes. In cases where cities do not have the jurisdiction to adopt new building codes, they can petition to the state for updated building codes, in line with the newest residential IECC and commercial ASHRAE codes. To improve the efficiency of existing buildings, local governments can enact energy audit, retrofit, and retrocommissioning policies. Building retrofits refer to modifications to existing buildings that lead to energy savings with a particular emphasis on equipment upgrades and building envelope improvements. Energy audits identify the energy efficiency upgrades that can be achieved through a retrofit. Efficiency retrofits after energy audits can typically reduce energy bills by 5-30%.14 Comprehensive upgrades can reduce commercial building use by 20-50%.15 Some cities have retrofit requirements for certain buildings. While these policies do not directly require energy efficiency improvements, they do motivate some building owners to take action. Furthermore, energy consumption data are critical for quantifying and evaluating building energy use patterns to achieve citywide energy savings. Benchmarking policies are continuing to advance nationally, and they provide a promising opportunity to save energy. For example, Atlanta’s Commercial Buildings Energy and Water Efficiency Ordinance aims to achieve 20% commercial energy reduction by 2020 by using annual energy and water benchmarking requirements to address information barriers.24 Atlanta also provides training sessions to help ensure benchmarking compliance. For more information on additional city building policy examples, visit ACEEE’s State and Local Policy database at database.aceee.org. For additional information or questions on local government energy efficiency policies, contact Ariel Drehobl at adrehobl@aceee.org or (202) 507-4038. Ribeiro, D., T. Bailey, A. Drehobl, J. King, S. Samarripas, M. Shoemaker, S. Vaidyanathan, W. Beg, and F. Castro-Alvarez. 2017. The 2017 City Energy Efficiency Scorecard. Washington, DC: American Council for an Energy-Efficient Economy. aceee.org/research-report/u1705. 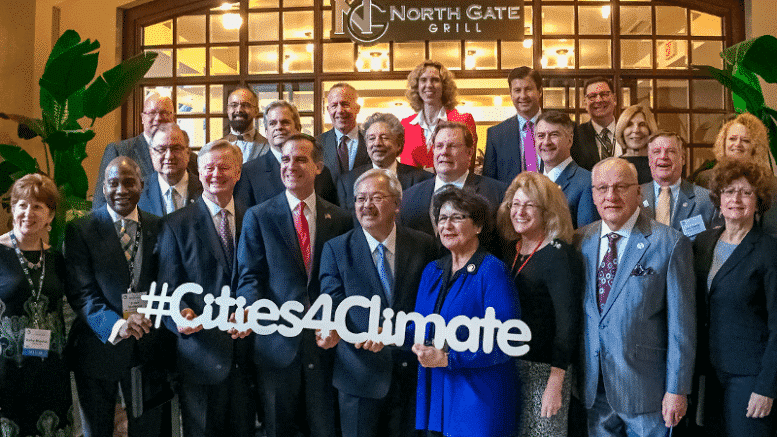 Climate Mayors. 2018. “Paris Climate Agreement” Accessed January 19, 2018. climatemayors.org/actions/paris-climate-agreement. Department of Energy. 2016. “Saving Energy and Money with Building Energy Codes in the United States.” Department of Energy Efficiency and Renewable Energy. energy.gov/sites/prod/files/2016/08/f33/Codes%20Fact%20Sheet%208-25-16.pdf. Department of Energy. N.d. “The Impact of Building Energy Codes. Accessed February 6, 2018. www.energycodes.gov/about/results. Savings estimates courtesy of the Pacific Northwest National Laboratory. See: Rosenberg, M., D. Jonlin, and S. Nadel. 2016. A Perspective of Energy Codes and Regulations for the Buildings of the Future. Journal of Solar Energy Engineering 139 (1). Doi: 10.1115/1.4034825. National Resource Defense Council & Institute for Market Transformation. 2016. Establishing a Plan to Achieve Energy Code Compliance in Cities. City Energy Project. http://www.cityenergyproject.org/wp-content/uploads/2016/11/CEP-Establishing-a-Plan-to-Achieve-Energy-Code-Compliance-in-Cities_2016Final.pdf. Institute for Market Transformation and National Resources Defense Council. 2017. Evaluating Energy Code Compliance in Cities. City Energy Project. November. www.cityenergyproject.org/wp-content/uploads/2017/11/CEP_Compliance-Assessment-Overview-IMT_2017-1.pdf. ACEEE. 2017. “Energy Code Compliance”. State and Local Policy Database. database.aceee.org/city/energy-code-compliance. Blackwelder, A. 2017. “Energy Star and LEED work together for private-sector energy efficiency”. 27 April. US Green Building Council. https://www.usgbc.org/articles/energy-star-and-leed-work-together-privatesector-energy-efficiency. Fowler, K., E. Rauch, J. Henderson, and A. Kora. 2011. Re-Assessing Green Building Performance: A Post Occupancy Evaluation of 22 GSA Buildings. Pacific Northwest National Laboratory. www.pnnl.gov/main/publications/external/technical_reports/PNNL-19369.pdf. Energy Star. N.d. “Media FAQs about ENERGYS TAR for commercial and industrial buildings.” US Department of Energy. Accessed February 21, 2018. www.energystar.gov/buildings/press-room/media-faqs. DC Department of Energy. N.d. “Green Buildings”. Accessed February 2018. doee.dc.gov/service/green-buildings. City of Boston, MA. N.d. “Building Energy Reporting and Disclosure Ordinance.” www.boston.gov/environment-and-energy/building-energy-reporting-and-disclosure-ordinance. Department of Energy. 2013. Energy Saver 101 Infographic: Home Energy Audits. August 15. energy.gov/articles/energy-saver-101-infographic-home-energy-audits. York, D., S. Nadel, E. Rogers, R. Cluett, S. Kwatra, H. Sachs, J. Amann, and M. Kelly. 2015. New Horizons for Energy Efficiency: Major Opportunities to Reach Higher Electricity Savings by 2030. Washington, DC: ACEEE. aceee.org/research-report/u1507. City of San Francisco, CA. N.d. “Residential Energy Conservation Ordinance.” Accessed February 21, 2018. sfenvironment.org/residential-energy-conservation-ordinance. City of Boulder, CO. N.d. “SMARTREGS”. Accessed February 21, 2018. bouldercolorado.gov/plan-develop/smartregs. Institute for Market Transformation. 2018. Successful Partnerships to Accelerate Efficiency: NYC Retrofit Accelerator”. http://www.imt.org/uploads/resources/files/PuttingDatatoWork_NYCRetrofitAccelerator.pdf. Environmental Protection Agency. “Media FAQs about ENERGY STAR for commercial and industrial buildings”. Accessed January 19, 2018. www.energystar.gov/buildings/press-room/media-faqs. City of Orlando, FL. N.d. “Building Energy and Water Efficiency Strategy.” Accessed February 21, 2018. www.cityoforlando.net/greenworks/building-energy-and-water-efficiency-strategy/. Institute for Market Transformation. 2017. “US Building Benchmarking Policy Landscape.” Accessed February 23, 2018. www.buildingrating.org/graphic/us-building-benchmarking-policy-landscape. Mims, N., S. Schiller, E. Stuart, L. Schwartz, C. Kramer, and R. Faesy. 2017. Evaluation of U.S. Building Energy Benchmarking and Transparency Programs: Attributes, Impacts, and Best Practices. Lawrence Berkeley National Laboratory. emp.lbl.gov/sites/default/files/lbnl_benchmarking_final_050417_0.pdf. City of Atlanta, GA. N.d. “Atlanta Commercial Buildings Energy & Water Efficiency Ordinance.” Accessed February 21, 2018. atlantabuildingefficiency.com/. City of Portland, OR. N.d. “The City of Portland Home Energy Score.” Office of Planning and Sustainability. www.portlandoregon.gov/bps/71421. Austin Energy. N.d. “Energy Conservation Audit and Disclosure Ordinance.” Accessed February 21, 2018. austinenergy.com/ae/energy-efficiency/ecad-ordinance/energy-conservation-audit-and-disclosure-ordinance.